from the rivers leaving the marine environment to flourish. Diving in this area of the Mediterranean we find impressive rock formations with peaks, pinnacles, underwater caves and landslides of massive blocks that have collapsed into piles on the seabed. Each one of these environments is a world in itself, with animals that live their entire lives there. Underwater visibility varies with the weather conditions, usually averaging 10 to 30 metres. Water temperatures are quite comfortable ranging from 15º to 29º Celsius / 59° to 85° Fahrenheit. 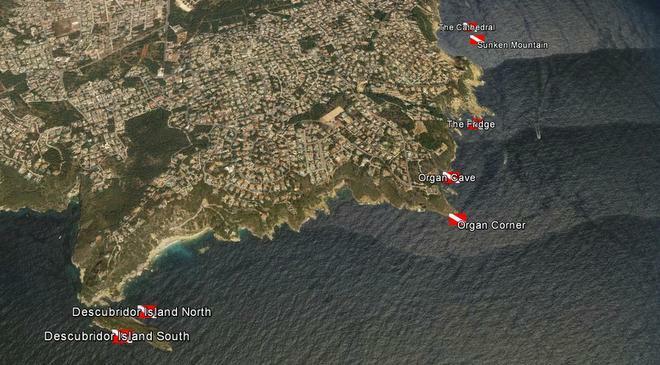 We are fortunate in Moraira to be centre of one of the best and unspoilt diving areas on the Costa Blanca. On the doorstep we have the step walls and ancient rock falls of Moraira with sites such as Cap Dór, the Labyrinth and the 3 Amigos. Then there are the fresh water caverns of the Moraig cave. Continuing along the coast, we have the diverse aquatic realm of Javea with underwater towers like Sunken Mountain and isolated islands such as the Cathedral, Descrubidor and Portichol. To the south is Calpe and the steep cliffs of the Penon de Ifac.